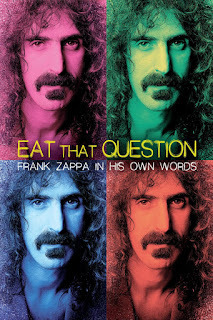 JP's Music Blog: DVD Review: Sony Classics Allows Frank Zappa To "Eat That Question: In His Own Words"
DVD Review: Sony Classics Allows Frank Zappa To "Eat That Question: In His Own Words"
Frank Zappa was one of the most outspoken musicians in history. He let his music do most of the talking, but when it was time for interviews, Frank Zappa was always the smartest man in the room. Sony Classics recently released a new DVD titled "Eat That Question: Frank Zappa In His Own Words," which allows the viewer into the world of Frank Zappa through historic footage of live performances and on-air TV interviews. Directed by Thorsten Schutte, he tries to capture the genius of Frank Zappa and portray him on screen in order for all of us to try and understand him a little better. Schutte allows Zappa to tell his story in his own words as he combines previously unseen footage together to chronologically tell the history of this brilliant, but misunderstood musician. While many of these clips are available on YouTube, the way Zappa is portrayed in this 90-minute documentary, shows the toll his body took on the demand of his art. While cigarettes and coffee was his diet of choice, it also allowed him to express all of his musical intuitions, tho sad to see his body digress as the video clips became more recent. Schutte does a masterful job merging performances and interviews, I only wish the full performances were available separately, but that would take up a whole other DVD. The film was an official selection of the 2016 Sundance Film Festival and a must see for Frank Zappa fans. To find out more about "Eat That Question: Frank Zappa In His Own Words," please visit sonyclassics.com/eatthatquestion.